Louisa Thomas’s elegant synopsis in the Paris Review of the 2011 French Open final between Roger Federer and Rafael Nadal, got me thinking about sports and age. I’m a big Rafael Nadal fan, and was happy he won. It was, for the most part, an exciting match. But I also love Federer’s game. It has been hard to watch him these last few years as he has fallen from invincibility. Federer still has plenty of beautiful tennis left, and still has what it takes to beat most of the guys on tour. Against Nadal, though, he can’t quite get it done. You can sense his frustration as mentally, he knows what to do, but his body refuses to fully cooperate. The 2011 NBA Finals have featured the team everyone expected to be there – the Miami Heat – and a team not many expected to see in the finals – the Dallas Mavericks. Both are teams of seasoned veterans. LeBron James famously left Cleveland this year to join Dwyane Wade in Miami for the purpose of winning another NBA Championship for the Heat. In contrast, the Mavericks feature a bunch of guys who are nearing their “sell by” dates, including Jason Kidd and Peja Stojakovic, alongside the brilliant Dirk Nowitzki. Although Miami is down in the series 3-2, there are those who still believe Miami will achieve its goal by pushing the series to a Game 7 and then winning it all. For my part, just as I did watching Federer-Nadal, I’m pulling for the old guys. 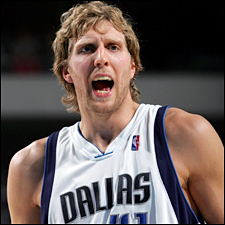 You get the sense that this is Kidd’s and Nowitzki’s last best hope for an NBA Championship ring. Nowitzki is playing with a level of heart and soul that some, after his previous championship losses, claimed he didn’t have. After all those cringe-worthy shots Kidd took in New Jersey, he has finally developed a reliable open jumper. Both Kidd and Nowitzki have sealed their NBA legacies with their playoff performances this year. But you don’t get the sense that either one has another championship run left in him. So let’s hope 2011 is the year of the legends in basketball and tennis. LeBron and D. Wade will have many more opportunities. For Kidd and Nowitzki, this probably is it. In tennis, although Federer lost to Nadal at the French, Wimbledon is right around the corner. The Williams Sisters, who have been plagued by injuries and out of tennis since last year, are due to return to the tour for Wimbledon. They, too, are no longer young phenoms. One hopes at least one of the Williams Sisters can recapture a bit of tennis magic and close out the year with a victory in at least one major. It would be great if the clock rolled back at Wimbledon this year, with Federer and one of the Williams Sisters raising the championship trophy yet again. We fans don’t want our legends to age and leave the sport, but we accept that it happens, just as it happens for all of us. It is painful to watch the greats weaken and get slower, because it reminds us of our own aging process. We pull for the legends to fight back against age just as we fight with our own faulty memories, our aches and pains, our slower reflexes. We fantasize that every great player, no matter what sport, will leave like Pete Sampras did – retiring after winning his last US Open title in 2002. But even when the legends don’t pull off a Sampras, it’s still great to see them out there, still competing, still giving it their all.